When I went to the comic store to pick up the first week of DC’s New 52, I asked the friendly clerk how the relaunch seemed to be going from a retailer’s perspective. If it was working the way DC intended to get new people into the shops and checking out all the new titles. He said that it seemed to have had an impact, and that he expected some titles to sell out by Saturday, even though the store ordered quite heavily on all of them. He pointed out Action Comics #1 as one of his favorites, but said he’d enjoyed what he had had a chance to read so far. There was one title, though, that he said he couldn’t finish reading, because he found the bizarre art so jarring he had to put it down. 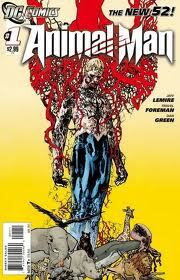 If there was one book to skip in Week 1, surely it was Animal Man #1. Looking through the comic at the store, I could definitely sympathize with him. Travel Foreman’s stark compositions and Lovern Kindzierski’s pastel color palate make for a very jarring experience on first glance. Animal Man looks nothing like any other comic on the shelf, and it’s easy to see why that might be grating to a lot of readers. Before I decided to go “all in” and simply buy every single title DC puts out this month, I seriously considered leaving this one on the shelf. But what the Hell? I thought. I’ve already got Rob Liefeld’s Hawk & Dove on the pile, so clearly bad art wasn’t going to hold me back. I might as well grab everything. I am so, so glad I did. Though it will take me a few more days to post reviews of all 14 books I picked up, I’ve now had a chance to read all of them, and Animal Man #1 gets my vote for Most Interesting title of Week 1. I’m not tremendously familiar with the character. Grant Morrison wrote a famous run on the series that I read in a trade paperback collection several years ago, but I’m hard pressed to remember even a single detail. I know a lot of writers (Morrison especially) have a soft spot for the character, as he’s always popping up in the backgrounds of panels in crossovers, at Justice League auditions, and at similar superhero social occasions. So I’m familiar with Buddy Baker, but I don’t have any great affection for him or connection to his continuity. In many ways, this makes him the perfect New 52 character for me. On closer read, Travel Foreman’s art perfectly complements Lemire’s heartfelt, increasingly creepy script. He utilizes negative space in a way that few artists can, making rooms actually look like rooms. In one panel, we get a sweeping street scene with a bunch of cop cars parked in the middle of a city street. Most of the panel is a flat blue space representing the city sky, and there in the upper corner, easy to miss if you don’t look directly at him, is Buddy Baker leaping through the sky. The next panel, in which Animal Man “sticks the landing,” gives a much better sense of movement and action than the way 99% of comics artists would have depicted it—close up on the hero with the city far below. It’s an extraordinarily effective technique. Foreman delivers lots of other compelling elements to the comic’s design. Before Animal Man leaves his house to face off against a gunman holding hostages in a local hospital, his wife reminds him to take his boots off outside so he doesn’t track mud all over the house. Fourteen pages later, when Buddy returns home from the hospital showdown, Foreman puts his empty boots atop the page’s first panel. Elsewhere in the book, he incorporates a panel into the surface of a kitchen counter. Baker, from the next panel, rests his hand on top of the last just as he would upon the kitchen counter. It’s kind of great. Also great: Foreman’s depiction of a creepy black white and blood red dream state in which a sleeping Baker confronts a terrible family secret and the sickening creatures that have somehow hidden in the common animal consciousness that fuels Animal Man’s powers. It’s a nice moment that sets up the payoff on the very last page. If Lemire and Foreman can keep up this sort of storytelling on a weekly basis, and if comics fans in general get over the occasionally challenging art and non-Batman-oriented story, I think Animal Man stands a chance to be the breakout title of the entire New 52 experiment. I’m genuinely excited to see what the next few issues bring, and sincerely hope that the market allows for a good long life for this very well executed approach.